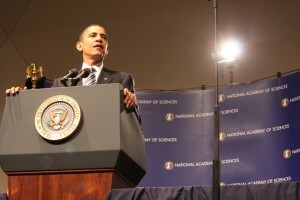 In a speech to the Annual Meeting of the National Academy of Sciences, President Obama committed the country to expanded science research, especially in the areas of energy independence and health care, and improvements to math and science education. Obama referred to but did not name specific investments included in the American Recovery and Reinvestment Act. Future budget plans will double funding to the National Science Foundation (NSF), National Institute of Standards and Technology (NIST), and the Department of Energy’s (DOE) Office of Science. It wasn’t clear when those budget increases are scheduled to take effect and whether they were immediate or phase-ins. While Obama made it clear that the federal government will continue to take on the most risk of research projects, in order to get private enterprise onboard, he plans to make the research and experimentation tax credit permanent. He claimed a 2:1 return on the credit’s investment, and pointed out that stabilizing the tax credit will encourage businesses to make take on more risky projects. The President got applause from the attendees when he emphasized his administration’s commitment to “developing a 21st century clean energy economy” by the naming of Dr. Steven Chu to Secretary of the DOE. Turning to the subject of health care, Obama reminded the audience of the medical record modernization legislation already in the stimulus package. In addition, he plans to increase funding to the National Institutes of Health (NIH), with $6bn going to a 10-year cancer research project. Having signed an executive order reaffirming science, the President has charged the Office of Science and Technology Policy (OSTP) with making sure science fact drives policy, “not the other way around.” The OSTP now has a web site to encourage public involvement in how the administration meet its science policy goals. He introduced the new members of the President’s Council of Advisors on Science and Technology (PCAST). According to the President, by 2015 the U.S. will be short some 280,000 science and math teachers. To help fill the gap, he has directed $5bn in Department of Education funding to a competitive state grant program called “Race to Top”. Obama then challenged states to raise their standards, modernize school labs, upgrade curricula [looking at you, Texas], and forge partnerships to use more science and tech in classrooms. He also encouraged states to enhance their teacher training and recruitment programs by rewarding good teachers, and setting up programs that encourage professionals [presumably alt-cert] to go into teaching. For post-secondary education, the President plans to increase grants and tax credits in order to bring the U.S. percentage of college graduates to the highest in the world. He also plans to triple the number of NSF graduate research fellowships. He gently suggested that the scientists spend more time with youth so they’ll become “makers of things, not just consumers of things.” To lay the groundwork for the future green economy, the DOE and NSF will be sponsoring a massive joint initiative to get students interested in science, math, engineering careers. President Eisenhower signed legislation to create NASA and to invest in science and math education, from grade school to graduate school. The scientific community rallied behind this goal and set about achieving it. And it would not only lead to those first steps on the moon; it would lead to giant leaps in our understanding here at home. That Apollo program produced technologies that have improved kidney dialysis and water purification systems; sensors to test for hazardous gasses; energy-saving building materials; fire-resistant fabrics used by firefighters and soldiers. More broadly, the enormous investment in that era –- in science and technology, in education and research funding –- produced a great outpouring of curiosity and creativity, the benefits of which have been incalculable. America’s young people will rise to the challenge if given the opportunity –- if called upon to join a cause larger than themselves. We’ve got evidence. You know, the average age in NASA’s mission control during the Apollo 17 mission was just 26. I know that young people today are just as ready to tackle the grand challenges of this century. In 1968, a year defined by loss and conflict and tumult, Apollo 8 carried into space the first human beings ever to slip beyond Earth’s gravity, and the ship would circle the moon 10 times before returning home. But on its fourth orbit, the capsule rotated and for the first time Earth became visible through the windows. Anders would say that the moment forever changed him, to see our world — this pale blue sphere — without borders, without divisions, at once so tranquil and beautiful and alone. Yes, scientific innovation offers us a chance to achieve prosperity. It has offered us benefits that have improved our health and our lives — improvements we take too easily for granted. But it gives us something more. At root, science forces us to reckon with the truth as best as we can ascertain it. Video and audio of the speech is available at the National Academy of Sciences website.